Ding dong! The doorbell rings just as Sophie and her mummy are sitting down to tea. Who could it possibly be? What they certainly don’t expect to see at the door is a big, furry, stripy orange tiger! The classic story of Sophie and her amazing tea-time guest has been loved by millions of children since it was first published over 30 years ago. 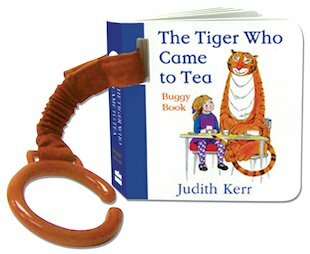 Now this classic picture book has been specially adapted into a buggy friend to keep baby entertained on the move. Just clip it to the buggy and let the stripy tiger delight your child wherever you go. This is good as it clips on to the buggy and you won’t lose it. It’s a nice book for very young children.